Covers are moving and unknown audio in this video. In this video—you can clearly see an orb/light go across the wall around her bed. Her cell phone is plainly laying on her nightstand and it is not car headlights. There is no audio in this one. 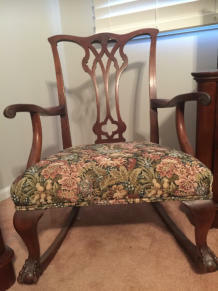 And here’s a photo of the old chair our client had refinished, that we think a spirit may be attached to. In this video, you see the covers moving but can’t quite make out the words.